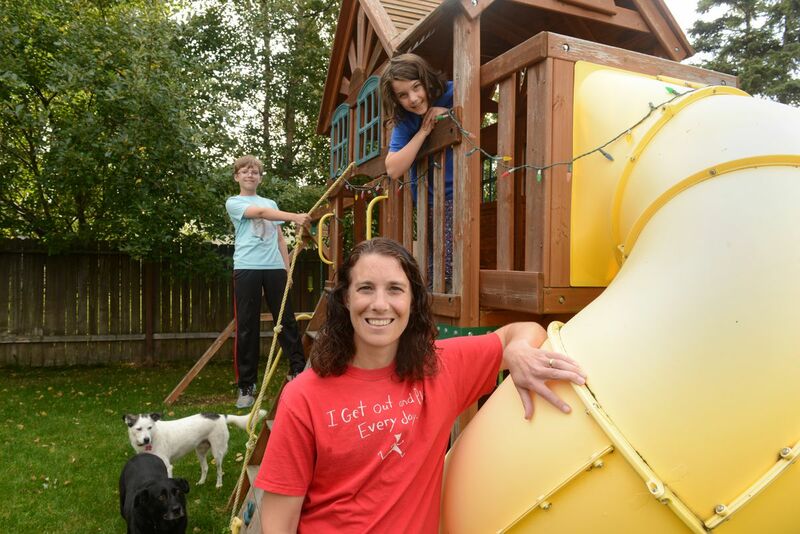 On the way to Sand Lake Elementary, Carey Carpenter and her two children listened to a podcast about the importance of recess for kids' health and school success. On the way home that day, Spencer and Anya told her their combined lunch and recess had been shortened from 60 minutes to 45. In an Anchorage winter, that schedule could mean children as young as 5 see the sun and breathe fresh air as briefly as 20 minutes a day. The change happened at the start of school a year ago. Since then, Carpenter has campaigned to increase the time children get for recess and lunch. Carpenter is a stay-at-home mom. She stopped working after being diagnosed with an aggressive breast cancer seven years ago. She started an organization for young people with cancer and prioritized health and time with her kids. But this isn't the story you might be expecting — the righteous cancer survivor and her cute kids winning more recess for everyone. Because the loss of recess is part of bigger, tougher story that involves all of us. After Carpenter began contacting school board members and distributing her research materials, the Anchorage School District confirmed the shorter time she was protesting — some schools had been giving even less. Now district policy places the minimum lunch and recess period at 45 minutes. Principals set the schedule individually in each of 65 elementary schools. About a fourth currently go over the minimum. A 2016 state law required schools give 54 minutes of physical activity a day, but the district says the rest of that time can come in PE, in classrooms or in recess time that teachers provide individually. Meeting the time requirement for each child depends on his or her teacher and isn't tracked. Kids need daily exercise, free play and unsupervised social time to grow and be healthy. I'm convinced the lack of playground time — away from screens — helps explain the current epidemic of teen obesity, anxiety and depression. District officials seem to get that. But the school day is simply too short for everything that's being demanded of them. Faced with mandates from the state, higher standards, and funding that doesn't keep pace with inflation, the district hasn't even been able to reach a labor contract with teachers. "I don't think this is only about recess. This is about a bigger picture," said Superintendent Deena Bishop. "We're asked to do more at the same time our schedule is changing because lack of resources, at the same time we don't have a contract because of lack of resources." Alaska law provides for the shortest school year of any state, and Anchorage's school day is 30 minutes shorter than the mean in similar districts outside the state. Compared to the highest-performing states, our children spend 3,000 fewer hours in school over their careers from kindergarten to graduation. That gap is the equivalent of 2.7 school years, according to figures Bishop provided. For the schools to add time to the day would require paying teachers more, and teachers are already demanding raises they deserve. It all flows downhill to the playground and the lunchroom. Carpenter doesn't believe the district is complying with the 54-minute activity requirement in state law. "I just think a 5-year-old kid can't sit through a six-hour day with only a 20-minute recess," she said. Research shows that physical activity improves academic performance by getting blood to the brain, she said. And by getting the wiggles out, I would add. "Kids learn by play — many other things than just what they're learning at school," Carpenter said. "All their social-emotional learning goes on in recess. So when we're limiting that, we're limiting their ability to be successful when they go out in the world." Two other moms, both dietitians with Southcentral Foundation, have joined Carpenter in protesting the quick lunch and recess period, but for nutritional reasons. Brandi Hennard said she saw the rush of school lunch when she sat with her kindergartner at Ravenwood Elementary last year. After the children transitioned from play and class, managed their things and food, changed their outdoor gear and got seated, they had less than 10 minutes to eat, she said. "I couldn't believe it. I was appalled by how little time they have to eat," she said. The result, she said, is that children don't finish and go through the day hungry, creating bad moods and difficulty concentrating. They also learn unhealthy eating habits by bolting their food, setting them up for obesity and other concerns. Dietitian Kelly Quisenberry, who has a first-grader at Rabbit Creek, said children are pressed by adults to eat quickly in the scant time allowed. Those who wait in line for hot lunch get even less time. Much of the food ends up in the garbage. I've spent time in elementary schools and I don't think these problems are limited to lunch and recess. There isn't enough time for anything. Teachers can be pressed and rushed. District policies count their time for each subject down to the minute. Children's recess and lunch time is the compressible space in this over-pressurized tank of needs. While Alaska lags academically and society asks schools to do more of our parenting, state policy doesn't link those requirements to funding. Funding depends on the price of oil and performance of state investments. Anchorage taxes itself as much as it is allowed for education. Many other Alaska communities do the same. The only give in the system is at the state level. But the leading candidate for governor and many legislative candidates promise bigger Alaska Permanent Fund dividends and no taxes, not more recess time or teacher compensation. As dietitian Quisenberry said, "Our kids are not as smart as in the Lower 48 because they have less time in school than in the Lower 48." The views expressed here are the writer's and are not necessarily endorsed by the Anchorage Daily News, which welcomes a broad range of viewpoints. To submit a piece for consideration, email commentary(at)adn.com. Send submissions shorter than 200 words to letters@adn.com or click here to submit via any web browser.